I am so lucky to have so many amazing friends in the blogging world! While I am cuddling on this new sweet little baby of mine, so many of them have offered to come by here and share some yummy recipes with you while I take some time off :) Today, you get to hear from my good friend, Jamielyn, from I Heart Nap Time. She is one incredible blogger, and if you haven’t checked her out, I highly recommend you do so! Hi friends! I’m Jamielyn from I Heart Nap Time and I’m SO exciting to be here today to share a yummy recipe with you. On my blog I share easy recipes, DIY projects and lots of free printables. I have to say, I know Nikki personally and she is just the sweetest! I’m so happy we met through blogging. An easy and delicious meal full of yummy flavor! Warm frying pan over medium heat. Butter both sides of your bread and then grill one side. Once it has browned, flip bread over to brown other side. Turn heat to low. 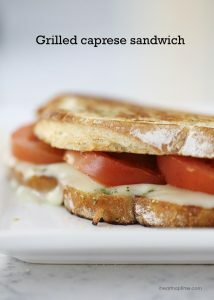 Then place pesto on the grilled side and the cheese on top. 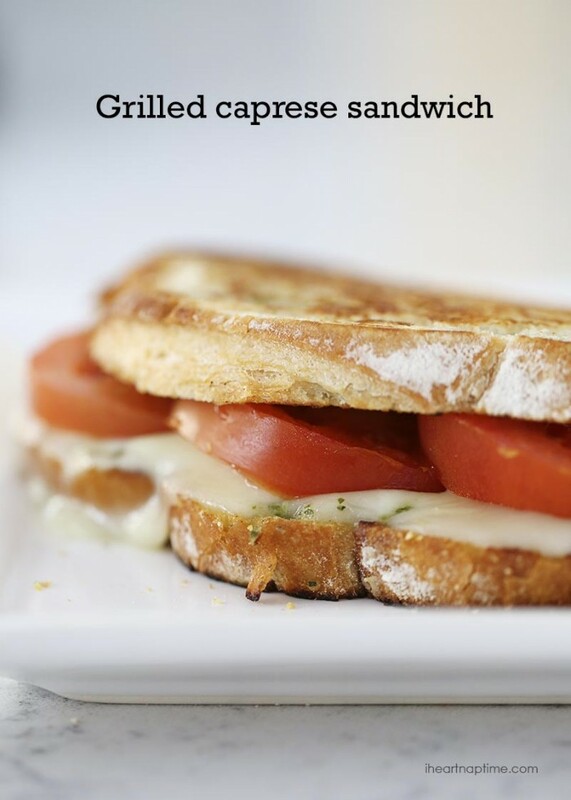 Allow cheese to melt a little, then place tomatoes on top of the cheese followed by the top piece of bread. Thanks so much for being here today, Jamielyn! Simple and delicious, and so fresh! I love it! Nothing like having good blogger friends like you to fill in during baby time!